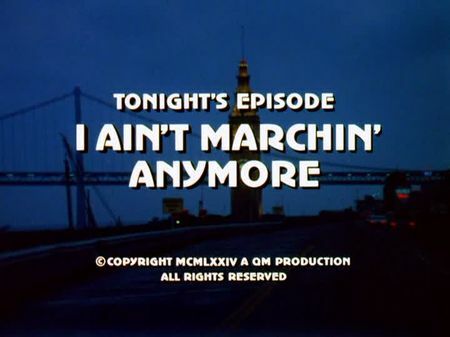 I have just added the screencaps for I Ain't Marchin' Anymore to the episodes' page. Steve goes undercover as a draft dodger after Bob Zahn, a former US Marine and AWOL of the Vietnam War, is found murdered just hours after he had given his parents a call. He soon gets in touch with a group of deserters and their head, Ron Harris, who owns some acres of land about an hours aways from San Francisco. After infiltrating the group, Steve has to realize that Harris - and Vale, one of the group's unofficial leaders - are still distrustful and cautious. In the meantime, Mike gets in touch with Zahn's girl friend who is embittered of how her boy friend was treated by the government. However, she finally opens a case with letters Zahn sent her during his stay in Vietnam, detailing a decisive occurence and revealing that he was eye-witness to a murder among his own people. Almost at the same time, Steve's life is at stake after Harris and Vale discovered he was an undercover agent. Filming locations of this episode are rather widely spread. It starts out at the corner of Post and Kearny Streets where Bob Zahn gets off the bus. He is then seen in a telephone booth across the street from his parents' house which has not been identified yet. Zahn enters the 'Medical Professional Building' in order to see Dr. Blakely at 660 Market Street, and is hit by a car and killed at a bus stop that used to be located across the street from Pier 40. Mike talks to a politician, both having a hot dog, on Polk Street in front of City Hall, walking down Civic Center Plaza. Going undercover, Steve has accomodation at Hotel Barclay located at 235 O'Farrell Street, in the meantime Mike sees the headmaster of Zahn's former high school which turns out to be Galileo High School on Russian Hill. He then drives up Potrero Hill to interview Mrs. Paulsen, Zahn's former class teacher. Steve is taken to Lime Point right under the northern end of the Golden Gate Bridge by the deserters, and then down to San Gregorino where Harris owns some acres of land. He tries to take the chance and get to a telephone booth at a gas station across the street from Peterson & Alsford General Merchandise at the intersection of La Honda & Stage Roads in San Gregorino. As a sidenote, this episode has an unusual narrator's announcement at the beginning of Act 1, stating that - on September 16th, 1974 - the President of the United States issued a proclamation that offered conditional amnesty to those who evaded the draft during the Vietnam War and to those in the military who deserted their duty while serving. Reason was the fact that this episode - which was filmed in spring of 1974 - did not air before the President's proclamation was issued, so the introduction explained that the story took place before.